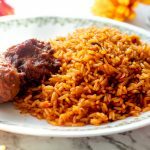 Party jollof rice is commonly the most sort after type of rice, because of its very unique taste. Most people feel the unique taste comes from preparation using firewood, but that isn’t always necessarily the case. 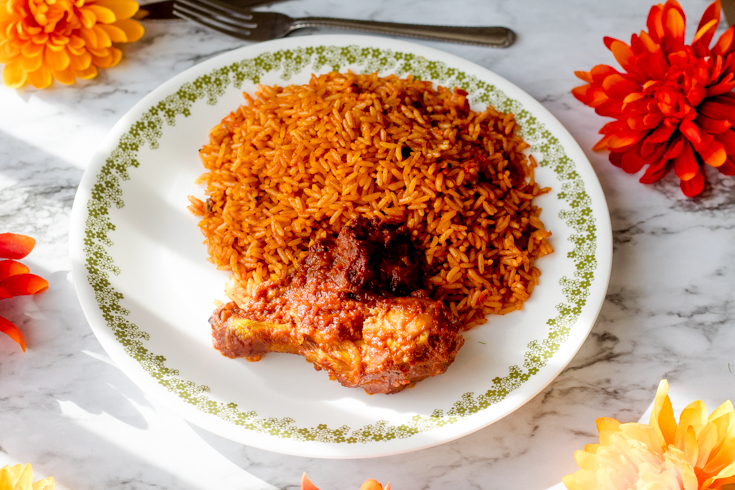 For me, it’s impossible to make rice with firewood, since my apartment complex doesn’t necessarily allow one to grill, let alone smoke anything,… but I’m going to give you a recipe that comes close to the wonderful taste of party Jollof without any firewood. Since I was in the party mood yesterday, I decided to prepare myself this awesome dish to celebrate our independence. I posted a few pictures of my cooking on Snapchat and was completely blown away by the number of people who wanted my recipe. 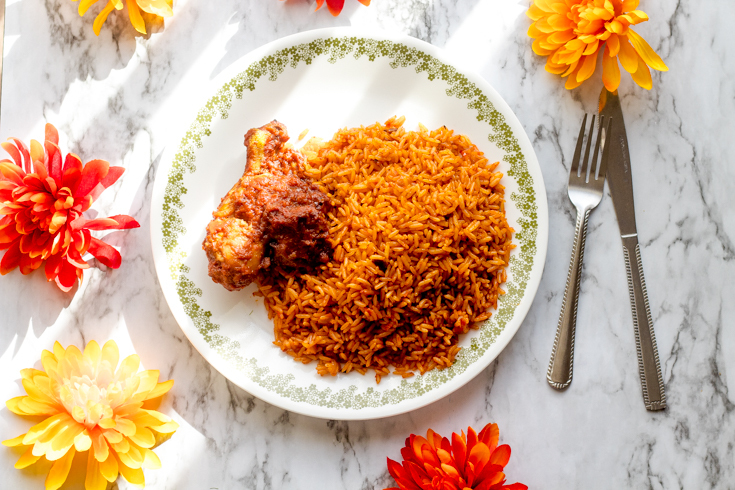 So to not be stingy to my fellow Africans as well as my brothers and sisters of other races/cultures I decided I would put up a blog post showing you guys step by step on how I prepare this delicious dish. I’ve been slacking lately on the food posts, but since its fall time, I guess its only right for me to jump back on the food post wagon. So expect to see more recipes in the future (fingers crossed). Note: Quantity of spices depends on your preference. Be sure to use your judgment and avoid over adding spices. A recipe card with exact measurement is also listed below. Heat about 4 tablespoons of canola oil and butter in a medium sized pot on medium heat and throw in some chopped red onions. Allow the onions to fry until the redness starts to slightly fade off. Next, pour in your tomato paste and let it fry with the onions. Make sure to stir the paste consistently to avoid burning. Do this for about 10 mins, or until the paste fully fries in the oil. Add in your crayfish for an extra tasty flavor. Blend some tomatoes, onions, habanero peppers, and red bell peppers together until you achieve a smooth consistency. Pour in the blended mixture into the pot and fry it together with the tomato paste. Add all your spices (BUT DON’T ADD SALT YET) and mix. Cover the pot and allow the tomato to fry in the oil. Add more oil if necessary. You really want to let the tomato fry to remove the slappy sour taste, so make sure you don’t rush this process. I would recommend letting it fry for about 20-30 mins. Be sure to continuously stir the mixture to avoid burning. At this point, while the tomato is frying, begin to wash your parboiled rice. Make sure to get rid of as much starch as possible by washing the rice until the water used becomes very clear. This helps to avoid the rice from sticking together when cooking. Once the tomato is done frying, add your chicken stock to the mix and taste to see if it requires any salt. Add salt if necessary and mix. Now add in your washed rice and mix it together with the fried tomatoes. Turn down the heat to the lowest on your burner and cover the pot. I personally like to cover the pot with aluminum foil before putting on the lid just to make sure the heat stays within the pot without escaping from the lid hole. Allow the rice to cook for about 30 minutes. After about 30 minutes open the pot and properly combine all the ingredients together. Cover the pot again, and let it cook for an additional 10 minutes or until the rice has fully blended in with the mixture. Let me know in the comments what you guys think of this recipe! And here’s a recipe card you can print of this. Wash the rice thoroughly to rid off starch and set aside. Pour in tomato paste and allow to fry for about 10-15 minutes, stirring continuously to avoid burning. Add in your blended mixture, crayfish, Maggi, cayenne & black pepper, white pepper, bay leaves, curry powder, garlic, thyme. Mix and fry for about 30 minutes, continuously stirring to avoid burning. Add in washed rice, and reduce heat to low. Cover and let cook for an additional 10 mins. For spices: Add as much or as little depending on your preference and taste choice. That’s what it is called over here where I live. In Nigeria, red bell pepper is called tatashe, while habanero is called scotch bonnet pepper. I personally use tomato and tomato paste. I haven’t done it any differently before. This blog post is absolutely beautiful! Thanks my sis for a detailed explanation of how to make jellof rice. Thank you so much. I’m glad you love it! This recipe is so easy to follow and it worked, even though I replaced some of your ingredients because I live in Canada. The rice turned out perfect and my roommates loved it!! I also love your energy!!!! Keep it up!! I’m an American girl dating a Nigerian boy for a year now. 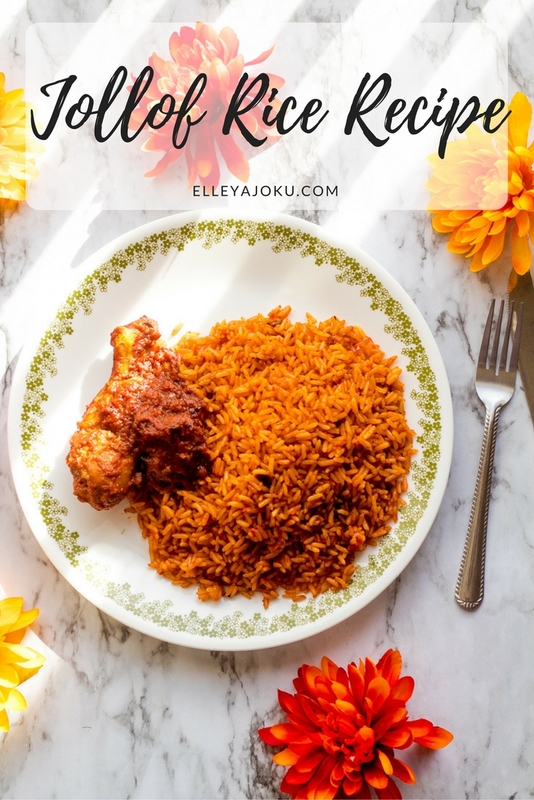 I had never tried jollof rice, but he talks about how great it is all the time so I wanted to try to make it for him. 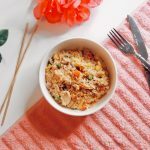 I came across this blog/recipe and followed it as best as I could given the ingredients found locally. When my boyfriend tried it, he could not stop sighing in nostalgia and satisfaction! He said the flavor was just right and the texture was right right! 😌 Pretty impressive I’d say. This is an excellent recipe! Thanks! Thank you for this recipe. Mine turned out with great flavor but is mushy. I have made two other recipes that also turned out mushy so I know it’s me – I just don’t know what I’m doing incorrectly because I follow the recipes exactly. Do you have advice for mushy rice? Thank you. how much tomato puree did you use? The recipe says one can but that isn’t really specific as different cans have different amounts. How do I make Meat to go with this? Some goat meat or chicken? I can’t wait to try my hand at this next week! What size can of diced tomatoes do you recommend? 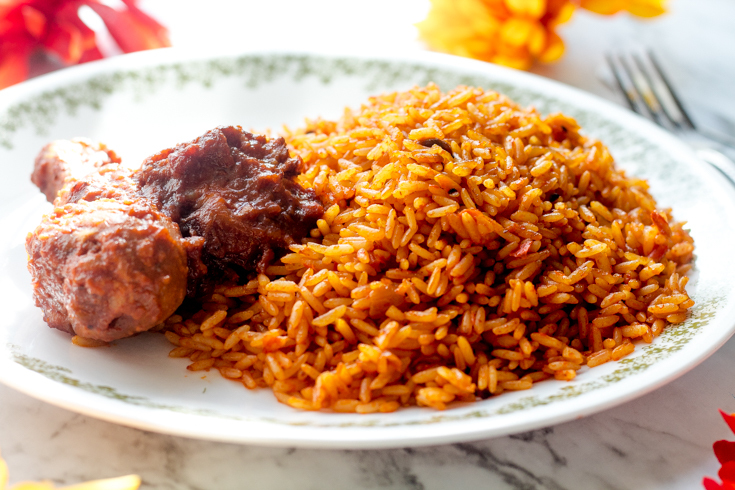 Also, I want to make beef meat with the jollof rice like my mum does. Do you have any recommendations on how I cook the beef in the rice at the same time? God bless! Yes! you have to fry the onions. The frying actually gets rid of the texture the moment you finish the preparation, so he won’t really notice it. You could try. I personally haven’t tried that method. But I do know quite a few people who do. I discovered your site from Google and also I have to claim it was a fantastic find. i don’t think you can make it without a blender, unless you have an alternative way of blending the onions, tomatoes and peppers. There is a video in this post explaining how to make this recipe. I hope it helps. Can you add chicken to the rice? And if you can, at which step should you add it?